Well, it’s certainly going to be hard to manufacture complaints based on that whooping, isn’t it? If you missed the game Friday night, you didn’t get a chance to see the Chicago Bears’ first string units dominate the Oakland Raiders. The score was 27-3 at halftime, with the offense racking up 252 yards with zero turnovers, with all three touchdowns coming from the running back position. Marc Trestman’s offensive designs became much clearer conceptually during the game. Quick drops, routes over the middle and short slants the outside, sweeps and off-tackle runs are all a part of this West Coast-style playbook. He pulled in various personnel packages formations often, switching from three receivers to two tight ends (both on the line and split wide) to traditional sets with a full-back behind the QB. Jay Cutler had an efficient performance, completing 12 of his 21 passes (which includes five drops). He scrambled for 13 yards on a third and ten, noting the defense’s clearance up the middle. Cutler was every bit the quarterback we wanted to see in this sorta-important exhibition. And he was protected as well, with no sacks taken on any Bears QB all night. 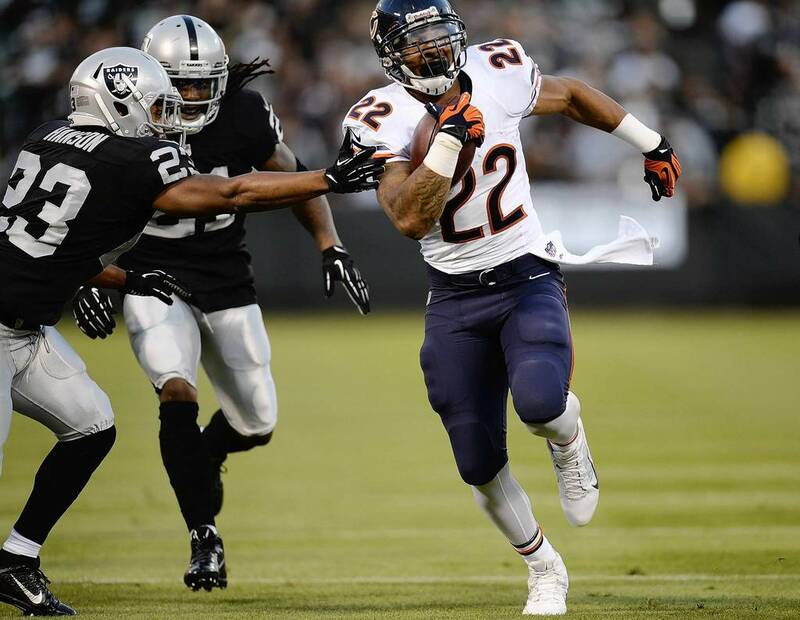 Matt Forte put on a friggin’ show Friday night, totaling 76 rushing yards on only six carries. He made two catches out of the backfield as well, with one swing pass netting 32 yards and a touchdown. The fun part about that TD play? It originated out of the shotgun, with Cutler flanked by both Forte and Michael Bush. That’s getting your best personnel on the field, no matter their position. The running calls were diverse and well-blocked by Chicago’s big-bodied receivers on the edges. Forte routinely had room to run when he bounced his runs outside the tackle box. He wasn’t the only Bear on display though, with Alshon Jeffery putting his stamp on the number two receiver position. Catching seven passes for 77 yards, Jeffery made up for some of the shortcomings of his teammates. His catching radius and large frame give Jay a clean target at receiver when Brandon Marshall is doubled (often) or ineffective (rarely). His showing gives me a lot of confidence that the preseason fantasy hype surrounding him might actually prove true. And here’s the real interesting part of this game: the offense surprisingly has room for improvement. There were five dropped passes between Marshall and Martellus Bennett, including one blitz-beater over the middle to Bennett that had the probability of a long gain. Shoring up these issues could turn this offense into a force early in the season. Defensively the Bears took advantage of a Raider team bereft of talent. With dynamic running back Darren McFadden on the sidelines (due to being too brittle and valuable to risk in preseason), the Raiders were fighting uphill. The Bear defense continued to be unpredictable, as coordinator Mel Tucker kept showing off various blitz and cover packages, including sending Charles Tillman on a corner blitz which resulted in his sacking of Matt Flynn. Tim Jennings, the Bears’ other Pro Bowl corner, picked off Flynn early in the game, on a ball thrown far behind the receiver. Isaiah Frey joined in on the fun, picking off Flynn over the middle of the field. While I won’t argue that the corners made excellent plays, there’s something to be said for the inexperience of Flynn, who has literally started two games in his entire career. These mistakes probably don’t happen with a quarterback on the level of say, an Alex Smith (a middle of the road QB to me). You saw what happened when Terrell Pryor hit the field though. His ability to make linebackers second guess and linemen lose containment wouldn’t be as much of an issue in the regular season. (You know, when teams actually gameplan for the specific opponent.) Pryor led the Raiders to their only decent drive of the first half, a few series after coming in for the ineffective Matt Flynn. But by the time the Raiders finally put some drives together, the game was over and irrelevant. -Uh, I wasn’t a huge fan of Josh McCown following this game. Rookie center Taylor Boggs snapped the ball entirely too early (or didn’t realize McCown was making a protection adjustment), so that turnover wasn’t all his fault, if at all. His interception was just a bad throw, however. He still doesn’t show enough accuracy for me, with a lot of balls just over or under-thrown. -What was with the sub-par first down marker on TV? The yellow line kept bleeding into player’s faces and jerseys. You can really tell a low budget when it comes to NFL presentation. -Did anyone else catch the security guard that walked into the field camera shot coming back in from a commercial? Dude saw what he did and then ducked out of sight like a bullet had just been fired. -Bostic is going to be the day one starter at middle linebacker. I feel pretty confident saying that. He’ll need to get better in pass coverage though, this being the second straight game I saw him bleed off his receiver and not recover quickly enough to prevent a touchdown. -Rookie running back Michael Ford has some MOVES. His touchdown run in the fourth quarter featured not one, but TWO spin moves to rid himself of defenders. He might not be a lock for the 53-man roster, but he’ll give Armando Allen a run for his money. Okay everyone, I’ll see you back here early this week for a preview of Thursday night’s game versus the Cleveland Browns! And check back soon for record predictions for all 32 NFL teams, as well as an in-depth look at your Chicago Bears!